Perfect trim quality thanks to innovative technology used. EasyFly Pro does not use vacuum or suckers, but accomplishes the opening by working in the trim away area of the book, thus avoiding any damage whatsoever on the cover. EasyFly Pro can handle long or multiple fold flaps without any problem. Opening only the bottom or the top cover, or, if required just a single cover is achieved by an easy setting. 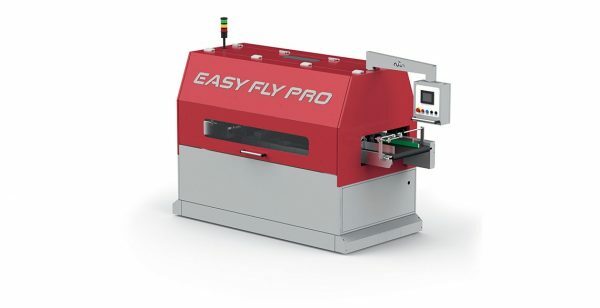 Easy Fly Pro can be positioned before or, if required, after the three knife trimmer by just replacing a piece of conveyor, without changing the layout of the existing line. By simply pushing a button EasyFly Pro is transformed into a regular conveyor belt, no bypass or similar equipment needed.